Every Tuesday the youth centre will be open to youth’s choice of programming and activities. Get crafty every Wednesday. Youth leading youth! Enjoy delicious bbq’ed food every Thursday at the Youth Centre. 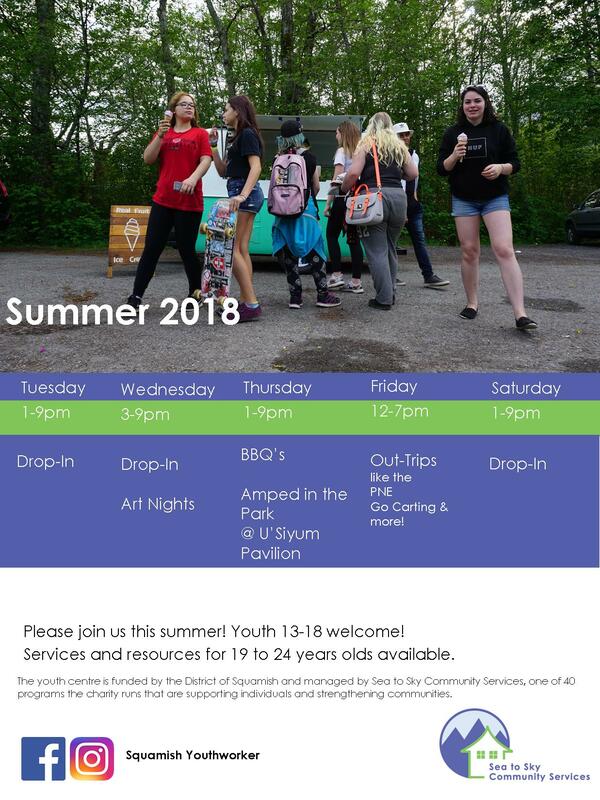 We will then go over to the U’Siyam Park downtown Squamish for the Amped in the Park performance arts night for youth put on by the Squamish Arts Council. Every other Friday during the summer we will be headed out of Squamish to various locations for fun events. Out-trips will include the PNE, Cultis Lake, Go-Carts and the Sea to Sky Gondola. Games nights on Fridays give youth the chance to win prizes and participate in all sorts of fun games. Saturdays youth can join in tons of hilarious and silly games throughout the day while hanging out at the youth centre. Friday 12-7pm – Out-Trip Days!